Habitat : South and south western india. Uses : It is useful for X-ray burns, dermatitis, cutaneous and disorders of skin. Drug from juice is tonic and is used in jaundice, ameneorrhoea, atonic and piles. Aloe Vera Gel has the remarkable ability to heal wounds, ulcer and burns. It provides benefit in reducing triglycerides, total cholesterol, blood fat, lipid levels & helps in reducing extra fat. It also helps in healing blisters & also provides relief from itching. It is also used for sunburns, insect bites, scrapes, and scratches. 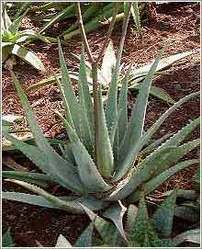 Aloe Vera leaves gel stops the bleeding of minor cuts easily. It moisturizes the skin and adds to its elasticity. It compensates the lost collagen and repairs the damaged skin tissues. It fades away the white lines or the marks and gradually removes them. It fights against the skin allergies and heals all the wounds. It is an excellent choice to get rid of the wound & burn marks that are formed in around 5 years or so.